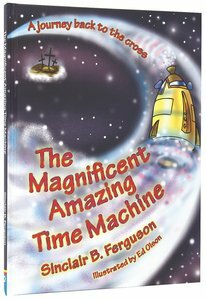 About "The Magnificent Amazing Time Machine"
Sinclair B. Ferguson (Ph.D., University of Aberdeen) is Senior Minister of the historic First Presbyterian Church of Columbia, SC, and Distinguished Visiting Professor of Systematic Theology at Westminster Theological Seminary. He is the author of numerous books including Taking the Christian Life Seriously; Man Overboard; Know your Christian Life; Grow in Grace; Discovering God's Will; Handle with Care; A Heart for God; Kingdom Life in a Fallen World; Children of the Living God; John Owen on the Christian Life; Undaunted Spirit; Daniel (Communicator's Commentary); Understanding the Gospel; Healthy Christian Growth; Read Any Good Books? ; Deserted By God? ; If I Should Die Before I Wake; The Pundit's Folly; The Holy Spirit; Let's Study Philippians; Let's Study Mark and The Big Book of Questions and Answers About Jesus.